"Private sector unions began their decades-long decline as the unchallenged economic preeminence the American economy enjoyed in the immediate post-war period gradually gave way to competition, first from the restored economies of Europe and Japan, then from the developing world. By contrast, public employee unions thrived as long as public sector budgets remained relatively insulated from macroeconomic trends. Those days are over, and the risks of depending on the good will of hard-pressed middle class taxpayers are becoming more apparent. 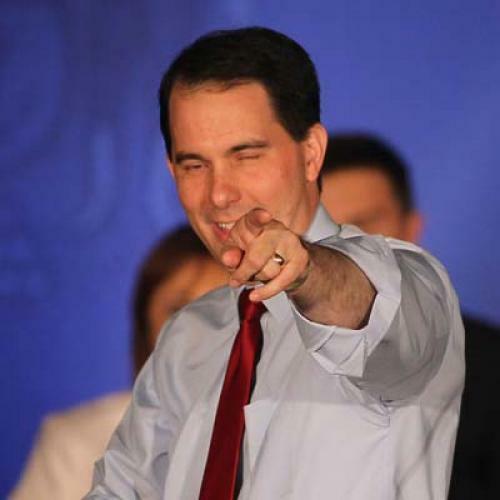 Democrats should brace themselves: Wisconsin is unlikely to be the only state to follow the trail Scott Walker blazed." Now, there is no doubt that Wisconsin was a devastating loss for organized labor. The unions invested millions in the fight against Walker, whose anti-collective bargaining reforms are already greatly diminishing public employee union membership rolls and treasuries, a big structural hit to the Democratic side (a major goal of the reforms, of course.) But how can Galston, and everyone else tolling the bell for organized labor today, get away without mentioning...Ohio? Just last November—not that long ago!—a new law very similar to Wisconsin’s, signed by another Republican governor, went up for referendum in the Buckeye State and it lost by 23 points. Some 60,000 more people voted against it than had voted for the governor who signed it, John Kasich, when he was elected a year earlier. Granted, there were factors aiding the pro-union side that their Wisconsin counterparts lacked: the Ohio law included police and firefighters (Walker shrewdly—cynically?—exempted them, even though their benefits are more generous than those of most other public employees); it was easier to win a referendum than a recall (less time elapsed, and it was a matter of simply rejecting the law, not having to vote for a whole new governor); and there was less money flooding the state from outside conservative groups than there was in Wisconsin. Still, in a state that is without question less progressive-minded than Wisconsin, a huge majority of voters rejected exactly the sort of anti-public employee union reforms that Galston and others say are now inevitable everywhere. Again, these are clearly tough times for public employee unions. And, as I said in my own Wisconsin postmortem, I've been challenging union leaders for several years now about their failure to reform obvious excesses in public employee benefits as a way to remove easy targets for their opponents. But anyone tolling the bell for public unions has to reckon with what happened in Ohio—a victory which, as I wrote in the magazine’s current cover story, is reverberating to this day, and helping to explain why Obama remains a couple points up in a state that should be very tough territory for him this year. It also explains why Obama is investing so heavily in Ohio—he’s spent more on ads there than in Florida and has 25 offices open around the state—even as some pundits were predicting he was effectively pulling out of the state a few weeks ago.